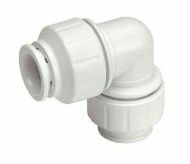 John Guest Speedfit is a push-fit system suitable for the plumbing of hot and cold water services and central heating applications. Speedfit fittings have been designed for use with both Speedfit and copper pipe. Note, you need to use a liner to strengthen / stiffen Speedfit pipe when using it with these fittings. Speedfit PEM0415W 15mm straight coupler / connector. Speedfit push-fit plumbing fittings are suitable for both copper and Speedfit pipe in normal UK domestic plumbing and heating systems. 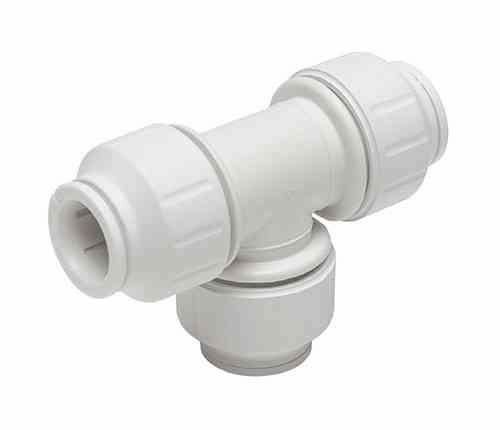 TSM15N 15mm John Guest Speedfit pipe liner / stiffener, needed in the end of your speedfit plastic pipe to strengthen it where it goes into a fitting. PEM221515W 15mm Speedfit stem elbow. 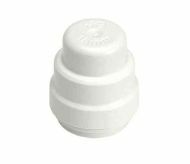 Speedfit PSE4615W 15mm stop end cap. 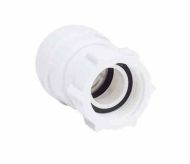 PSE3201W Speedfit 15mm tap connector. 15mm pipe in one end, female 1/2 inch BSP thread on the other. Suits sink / basin taps and toilet float valves. PEM0215W Speedfit 15mm equal tee. You will need one of these TSM22N strengthening inserts / liners in the end of your 22mm Speedfit plastic pipe. This PSE4622W 22mm stop end cap blanks off an unused 22mm pipe. 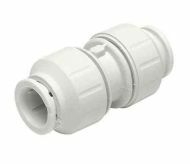 PSE3202W Speedfit 22mm tap connector. 22mm pipe in one end, female 3/4 inch BSP thread on the other.